The landscape is diverse, rugged and beautiful. Regardless of the time of year or weather, it has the power to transport you to a place of calm and quiet relaxation away from the hustle and bustle of modern living. 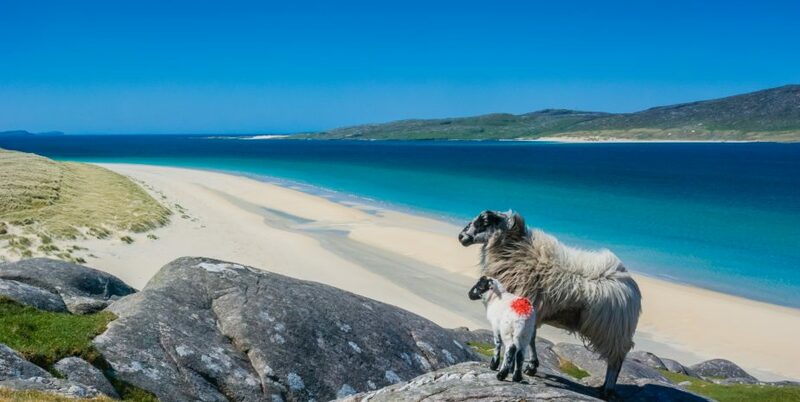 Whether you want to enjoy the peace and tranquility or explore the great outdoors, the Isle of Harris has plenty to offer you. Contrasting scenery is the main impression of the island. 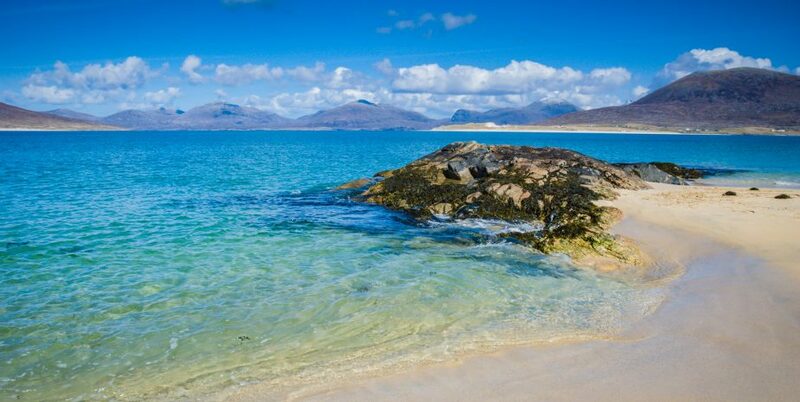 Moonscape features of the ancient, glacier scoured mountains in the north, give way to the rich machair and miles of stunning, golden sandy beaches of the Outer Hebrides. The beaches, repeatedly voted as some of the most beautiful in Europe, lie off the West Cast, whereas the East Coast boasts the rocky landscape and is dotted with isolated fishing villages. Tarbert is the main town of this part of the Outer Hebrides. It has a newly opened distillery, a few small shops, bank and ferry terminal for ferries to and from Uig on the Isle of Skye and Lochmaddy on North Uist. We offer two hotels in Tarbert, as well as other bed and breakfast accommodation around Harris and the the adjoining Isle of Scalpay. 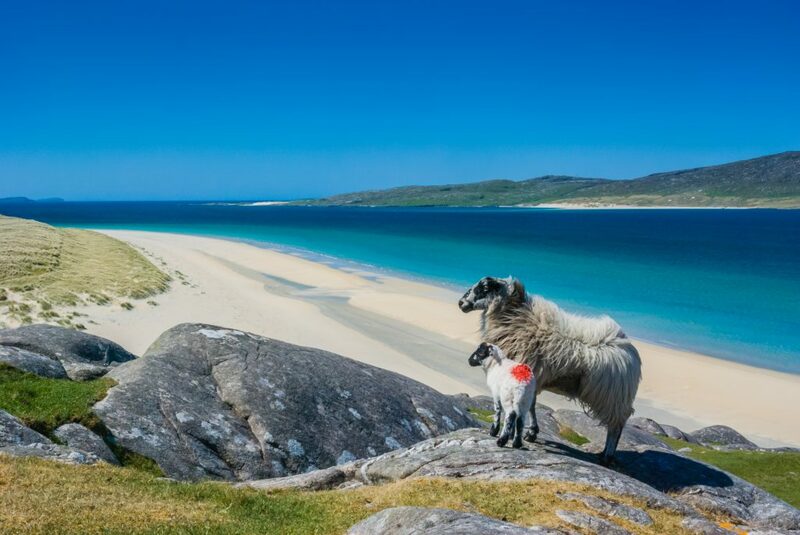 While in Harris, take a detour across the bridge to the Isle of Scalpay, a thriving fishing and crofting community with lots of wildlife and a popular seasonal bistro. Harris Tweed is still woven by crofters here on the Isle of Harris (as well as in Lewis), on traditional foot driven pedal looms and weaving demonstrations are available. In Tarbert, there’s a large Harris Tweed shop with plenty to interest those taking holidays in the Isle of Harris. A little way south is one of our special favourites, the Harris Tweed Company Grosebay (previously known as Isle of Harris Knitwear Company), where you’ll find designer Harris Tweed products. Many of them are so individual that they can tell you the weaver. You can drive round south Harris’s circular road in around three hours, but it’s sure to take you longer, as you won’t resist frequent stops to take in the stunning land and seascapes. Before commencing your circuit from Tarbert, you may wish to take a 10 minute drive along the coast north of the eastern sea loch, to visit the tiny island of Scalpay, linked to Harris by a bridge. There’s a small village with community shop, two harbours and pleasant walk to the lighthouse. It’s really worth visiting the delightful villages set amongst the rocky inlets of the Bays area of the east coast, such as Ardvey and Flodabay. Then experience the deep contrast with Seilabost and Horgabost set among the sandy inlets and machair of the west coast. Don’t miss the sands at Luskentyre. Around the villages, you’ll find local cafes, art and craft galleries and other small enterprises with quality local products. In the south of the Isle of Harris, near the small sheltered harbour of Rodel you can visit the ancient St. Clement’s church, where Clan Macleod chiefs worshipped since the 1500s. It’s now owned and cared for by Scottish Heritage and occasionally plays host to delightful wedding ceremonies. At the southern tip of the Isle of Harris lies the small ferry port of Leverburgh, where a ferry weaves its way, several times a day (including Sundays) around the reefs and shallow water of the Sound of Harris to the Island of Berneray. We offer bed and breakfast accommodation in Leverburgh. That’s convenient for the early morning ferry to Berneray and the Uists, the next part of your Outer Hebrides holidays. The nine hole course at Scarista is a test for every golfer on holiday in the Western Isles, but the views will turn every round into an even greater pleasure. Currently, green fees are advertised at just £20. Leave plenty of time to make the trip up the west coast, as you’re sure to want to stop and walk some of the wonderful shell-sand beaches. 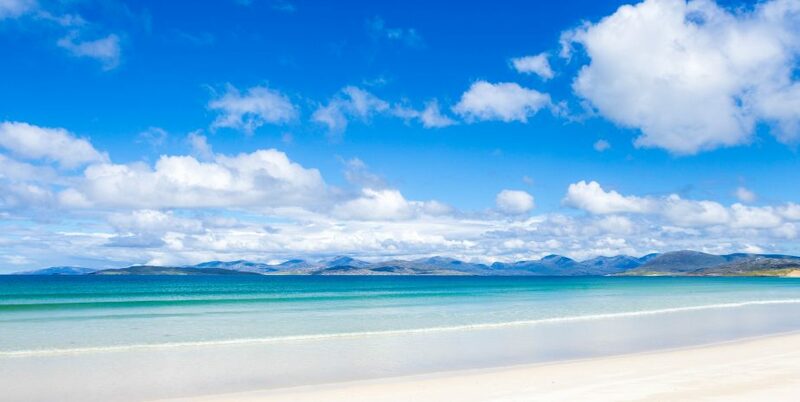 The most notable are Scarista, Borve, Nisabost, Seilebost, Horgabost and Luskentyre. 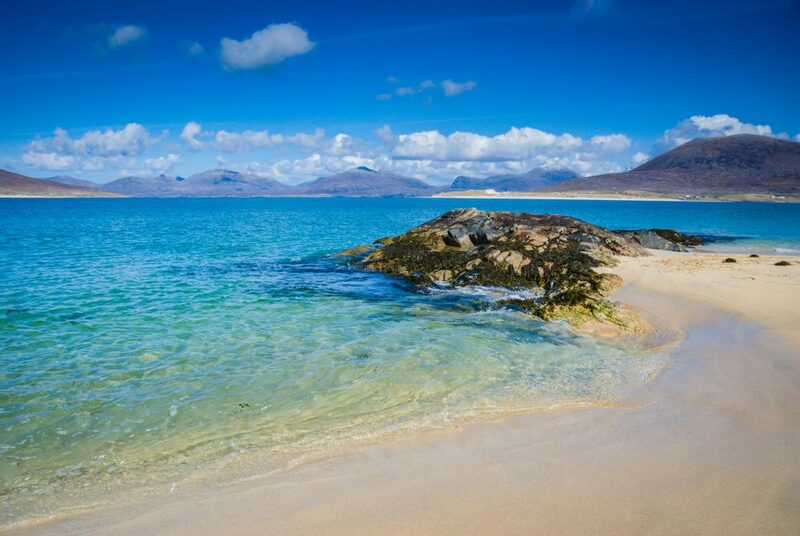 To the north west of Tarbert, a winding 14 mile single track road reaches a magnificent conclusion at Hushinish, with its wonderful soft sand beach. 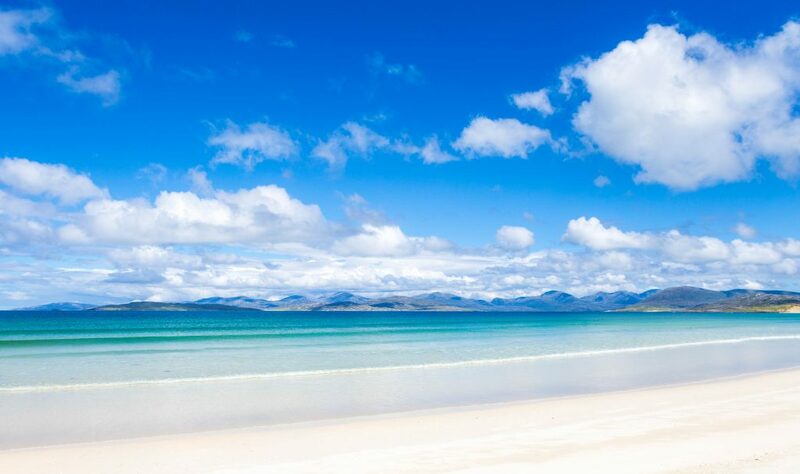 There are fantastic views to neighbouring islands, including Taransay and Scarp (the setting for the acclaimed feature film, The Rocket Post). The road actually passes through the grounds of Amhuinnsuidhe Castle, built in 1865 for the 7th Earl of Dunmore, and now used as a prestigious venue for house parties. Also a little way along this road is the most remote tennis court in Britain. In a beautiful setting overlooking the Atlantic ocean on the road to Hushinish, in North Harris, the new court at Bunabhainneadar offers a top class artificial grass surface and a cosy wooden pavilion (in case it rains! ).